Ron Rosella grew up in the wholesale produce business. Now 71, it’s his name that — until last week — could be found on a fleet of trucks that ply our roadways. “Roll with Rosy,” read the legend on back, nodding to the nickname given him and his late father, Michael, who founded Rosella’s Fruit & Produce near Pike Place Market in 1942. Rosy’s trucks are no longer rolling. Today, Ron, along with 18 of his employees — his daughter among them — is on the payroll of another family-run outfit: Pacific Coast Fruit (PCF), a Portland-based wholesaler 10 times Rosella’s size. Difficult though it may be to shutter the family business after six decades, the time was nigh. After a lifetime spent pushing mountains of produce in a cutthroat industry whose margins are slimmer than a cucumber slice, it was time for a change. “Ron always had a vision of how we could do this,” says Tom Brugato, CEO of Pacific Coast Fruit, founded in 1977 by his father-in-law, Emil Nemarnik. “He knew the industry was going to force him to spend a lot of money to update computer systems and institute warehouse improvements” at two Seattle locations. 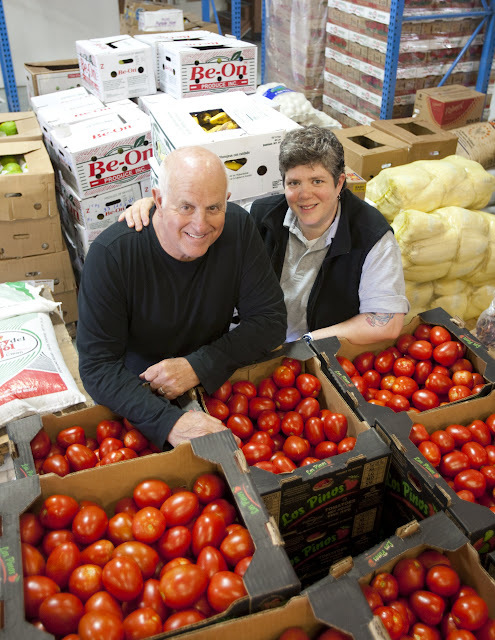 A friendly competitor with a local distribution center in Kent and clients as far north as Vancouver, B.C., PCF coveted Rosella’s relationship with food-service businesses — and that’s one of the things they’re buying by bringing the Rosellas on board. “When I was a kid,” Ron recalls, “My cousin Nick and I would catch a bus at 4 a.m. on Beacon Hill. We’d get off at First Avenue, walk down Skid Row and end up on Western Avenue,” where they’d help their fathers by sorting tomatoes and potatoes. But Rosella’s remained, later moving to Occidental Avenue, “right where Safeco Field is now,” recalls Ron’s daughter, Sumitra Rosella, 43. Her childhood memories are as rich as his. “My dad wore overalls and worked six days a week. He’d get up at 2 a.m. and get out at 4 p.m.” Sometimes she’d go with him. According to Ron, Rosella’s was the first wholesaler in Seattle to sell fresh herbs and radicchio, the latter flown in from Perona, Italy. “People thought it was red cabbage,” Ron says, “and we’d give it to our customers and tell them, ‘Hey, try this stuff!’.” When they carped that their customers would find it too bitter, “We gave it to them for free and said, ‘Give it to them for free. '” Sold! “Those were the good old days,” insists Sumitra, who in her 20s owned the original Sostanza restaurant in Madison Park. At Pacific Coast Fruit, she’s reprising her role from Rosella’s — as liaison between local organic farmers and restaurateurs. Though she has no interest in running a family business, she’s proud to follow in her father’s footsteps by introducing local chefs to a wider world of produce.